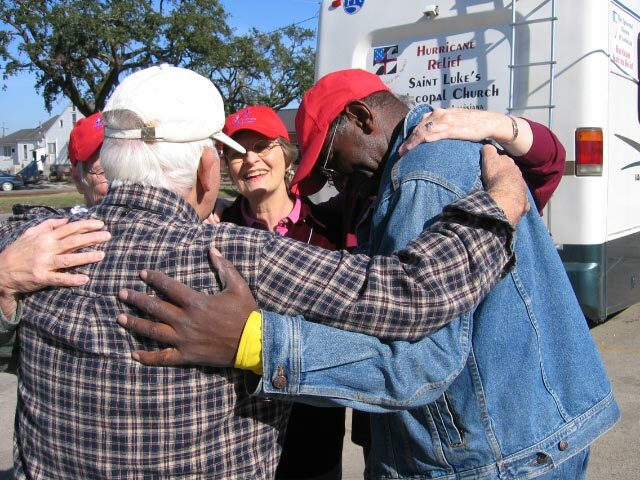 “We give thanks for the community” is our mantra here in the Episcopal Diocese of Louisiana as we reflect on the 10th anniversary of the landfall of Hurricane Katrina on August 29th and Hurricane Rita on September 24. Weighing heavy on our hearts though is the grief of all the people who suffered (still suffering) unimaginable loss and for whom this anniversary brought back nightmarish memories. At this anniversary we want to give thanks to the people across our diocese and across the world who came together to shine the light of God on all those suffering. Relief efforts began immediately after the storm and a few of the programs born in the wake of Hurricane Katrina are still operating today. We applaud all those who gave of their time to bring our storm ravaged diocese back to life and provided hope to so many. Thank you to all those, especially the churches in the northern parts of our diocese, who received and cared for the hurricane evacuees. Thank you to the 15,000+ people from around the world who volunteered with us to gut flooded homes, float drywall, paint, serve meals, offer prayer and support, held our hands and listened to our stories. Thank you to all those who made donations to help us rebuild our churches, our community, our homes. We give thanks to Episcopal Relief and Development for being an early partner in our recovery. You stood by our side throughout these years and we are truly grateful. Listed below is a look at the relief work of our churches starting from the first early days after the storms through around 2007. The information was complied from Churchwork, Episcopal Community Services Newsletters, Diocesan Journals, and our collective memories. Please let us know if we, unintentionally, left your church’s efforts of this list. We are, however, intentionally not mentioning any one person’s name. This is for several reason. Mainly, once we do, we know we will leave off the important work performed by too many people and once we start this list would never end. We give our thanks to God for you! St. James parishioners and clergy volunteered at shelters housing hurricane evacuees in the Baton Rouge area. They cooked and delivered breakfast every morning. They also provided shower facilities in the evenings at the church. The Baton Rouge area clergy worked in shifts to provide pastoral care to evacuees in shelters. St. James provided office space to staff members of the Bishop’s Office, Trinity Church in New Orleans, and Christ Church Cathedral, and any clergy in need of a place to work. They also offered daily Eucharist. Episcopal High in Baton Rouge provided office space to the administration office of St. Martin’s School in Metairie. They also created an evening division of classes to accommodate 700 additional students. The Episcopal schools in Baton Rouge (St. James. St. Luke’s, and Trinity), Covington (Christ Episcopal), and Houma (St. Matthew’s) opened their doors to students from schools in the New Orleans area. The Office of Disaster Response was formed in September 2005 to assist in assessing damage and needs of churches; receive and process offers of money, goods, volunteers, housing, employments, and church partnering; and coordinate the distribution of goods and services. St. Luke’s, Baton Rouge, housed in their parish hall 25 – 30 families of infants in the intensive care unit at the nearby Women’s Hospital. They provided housing and meals. St. Luke’s, Baton Rouge, housed federal law enforcement officers. St. Luke’s, Baton Rouge, delivered water and food to Bogalusa (even before federal aid arrives) and Covington. St. Luke’s, Baton Rouge, shared office space with Church of the Annunciation, New Orleans. St. Augustine’s Church, Baton Rouge, volunteered with relief efforts in Baton Rouge. St. Alban’s Chapel, Baton Rouge organized school supplies for the 10,000 displaced students who enrolled at Louisiana State University after the hurricane. 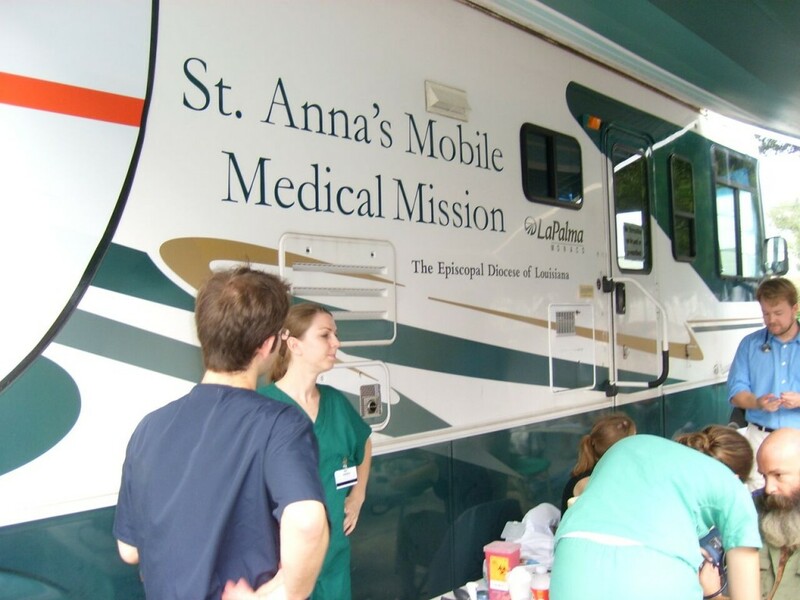 St. Luke’s, Baton Rouge, purchased an RV, called the Mobile Respite Care Unit, for the diocese to be used for delivering supplies and offering pastoral care to hard hit areas. Some of the regular distribution points were located at Church of the Annunciation and in the Lower Ninth Ward at the corner of Caffin and St. Claude Ave (what is now the location of All Souls Episcopal Church). Volunteers came from St. Luke’s, Baton Rouge; St. Mark’s, Harvey; Holy Spirit, Baton Rouge; and Christ Church, Slidell. St. Matthew’s, Houma, distributed cleaning supplies, food and water. St. Andrew’s, Bayou Dularge, distributed supplies donated from a church in Delaware. St. Luke’s, Baton Rouge, assisted in the distribution. Grace Church, St. Francisville, provided food and other services to evacuees and those who relocated to West Feliciana Parish. St. Margaret’s organized and delivered (by airlift) baby formula and baby supply to Bogalusa after word got out that supplies were running out in the town. St James purchased many of the supplies. The diocese and St. Margaret’s hosted a Day of Reflection and Preparation for clergy, spouses, and church staff. St. Margaret’s housed and fed volunteers from Arkansas who traveled to Louisiana to cut and remove trees. Parishioners from St. Paul’s / Holy Trinity in New Roads housed families from churches in New Orleans. Christ Church, Slidell, distributed relief supplies from their parish hall. St. Michael’s and All Angels held services for parishioners from St. Luke’s, New Orleans. Christ Church Cathedral distributed relief supplies, cleaning supplies, hygiene kits, school supplies, toys, clothing, and water. Christ Church Cathedral held a concert, entitled “All the Saints” to commemorate the Cathedral’s bicentennial and Hurricane Katrina. The concert featured Irvin Mayfield and the New Orleans Jazz Orchestra. The audience filled the Cathedral and spilled out on to the steps and into the chapel. 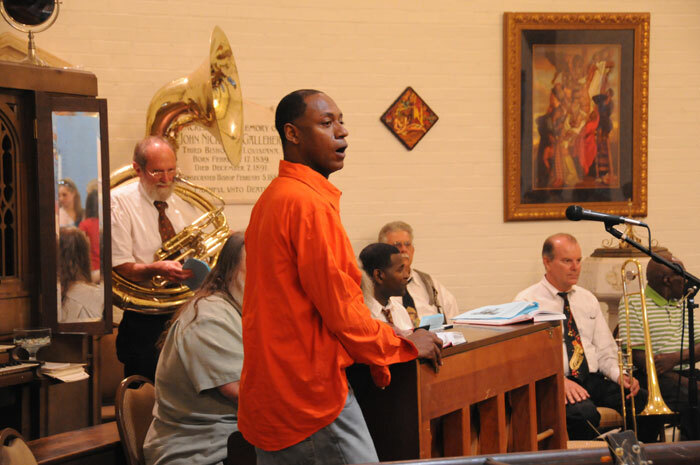 It was named one of the most poignant post-Katrina musical moments in a recent article in the Times Picayune. The day before the concert, a service to celebrate the bicentennial of the founding of Christ Church was held at the Cabildo, the location of the first church services on November 17, 1805. A second-line parade was also held that marched through the French Quarter to St. Louis Cemetary #1. This was the first second-line parade held in New Orleans since Hurricane Katrina made landfall. Chapel of the Holy Comforter distributed relief supplies, cleaning supplies, snacks, and water. 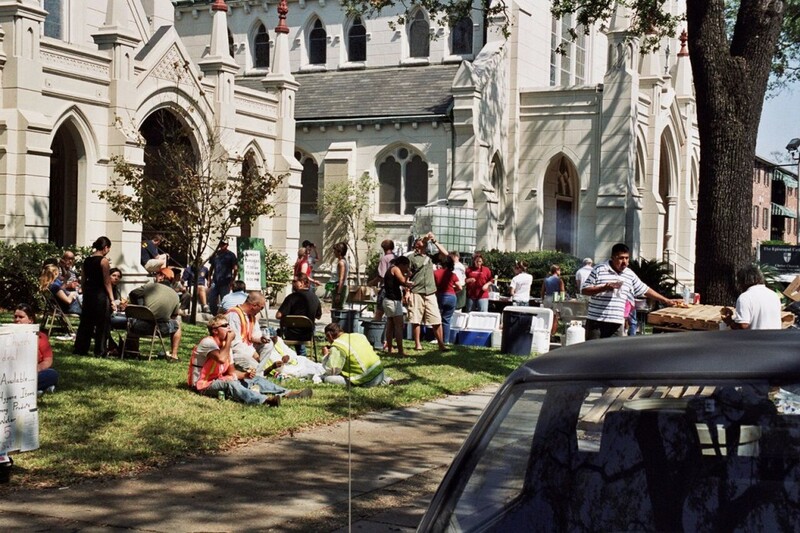 Chapel of the Holy Comforter organized neighborhood clean-up days for the Lakefront and Gentilly neighborhoods. On the clean-up day in the first year, St. James provided the mid-day meal for volunteers. Chapel of the Holy Comforter housed a temporary day care center for University of New Orleans faculty and students. St. Paul’s, New Orleans, provided pastoral care to their neighbors. St. George’s shared their office space with Grace Episcopal Church. Trinity, New Orleans, provide pastoral, monetary, and material support to the New Orleans community: 1) Trinity Social Services- a program that helped families with food, clothing, and household goods; hosting FEMA job fairs; and assistance in navigating the services available in the city; 2) Trinity Counseling and Training Center- provided counseling to those struggling with the aftermath of the hurricanes; 3) Helped raise funds for St. Thomas Community Health Clinic to hire a pediatrician and nurses to care for the expanded post-hurricane patient caseload; 4) Started Trinity Connects to stimulate partnerships and collaborations among community leaders to address housing, education, medical care, mental health, and employment. The schools around the diocese held supply drives. Parishioners from Church of the Holy Communion, Plaquemine, repaired a home for a parishioner of St. Andrew’s, Bayou Dularge. 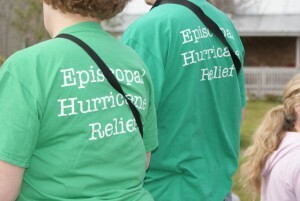 With a grant from Episcopal Relief and Development, The Office of Disaster Response opened compassion centers operating out of St. Luke’s, New Orleans; St. Paul’s, New Orleans; Chapel of the Holy Comforter; the Urban Ministry Center (located next door to the Bishop’s Office), and one in LaPlace in partnership with Grace Community Services. St. Anna’s formed the Ministry to Musicians, a once a week feeding ministry, a place for musicians to perform, and receive health care. As volunteers began arriving in New Orleans, the following churches started volunteer housing programs: St. Andrew’s, Chapel of the Holy Spirit, St. Augustine’s, St. Martin’s, St. Luke’s, St. George’s, St. Mark’s, and Church of the Annunciation. All Souls Church would later form a volunteer housing program. The programs at Church of the Annunciation and All Souls are still in operation today. Starting in 2006, the Office of Disaster Response added house gutting, house repair and case management to its services. 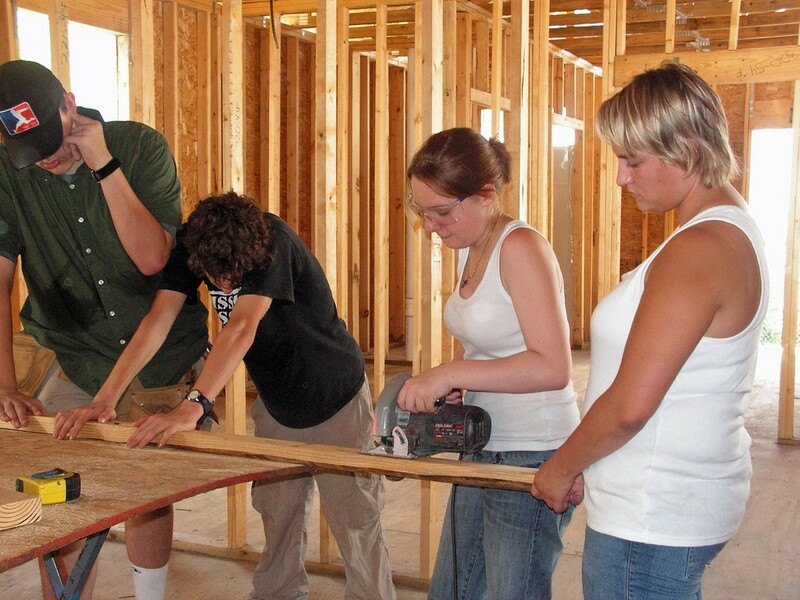 Thousands of people (around 15,000) from around the diocese, the United States, and the world volunteered with the rebuilding program. St. Philip’s, New Orleans, started an Emotions Anonymous Group to assist those having a difficult time coping with the problems of rebuilding and recovery after the hurricane. St. Anna’s hosted a memorial service for those whose pet died during the hurricane. All Souls Episcopal Church formed by the Episcopal Diocese and Church of the Annunciation in the Lower Ninth Ward as a parochial mission station. The church was named to honor those souls who will find the church and for those who were lost in the flood water of Hurricane Katrina. They held services in a garage of a parishioner. Christ Church, Covington, in collaboration with the St. Tammany Outreach for the Prevention of Suicide formed a suicide prevention program. In addition they offered free counseling to children through a support group of those between ages 6-11 dealing with the issues of grief and loss after the hurricane. Christ Church, Slidell, formed a counseling program to assist those struggling with grief and loss after the hurricane. The residents of Christwood Retirement Home launched a project called “Delacroix-to-Go” providing food and household supplied to residents of Delacroix, LA. 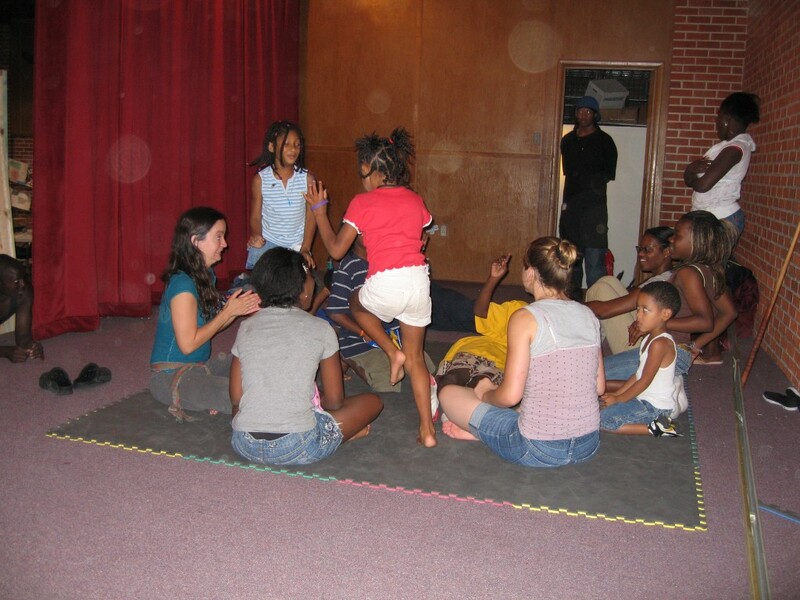 St. Paul’s, New Orleans, and St. Luke’s, New Orleans, formed Homecoming Centers that allowed families returning to the neighborhoods access to case management services, child care, computer access, food, laundry facilities, a place to organize community meetings, and so much more. 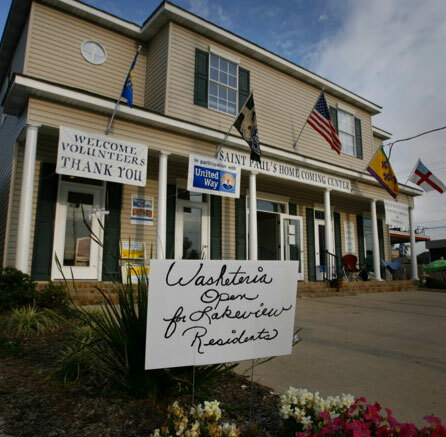 The St. Luke’s Homecoming Center advocated for the residents of the 7th Ward, Treme, and Mid-City neighborhoods of New Orleans. They held a summer camp for children called Camp Ubuntu. They housed thousands of volunteers coming into the city to help in the rebuilding. Chapel of the Holy Spirit opened the Katrina Legal Outreach Project to provide information and legal assistance on hurricane-related issues. St. Anna’s offered ESL classed to support the large influx of immigrant labor primarily from Central America. The program grew and became a large community who called it Oportunidades NOLA. St. Augustine’s offered ESL classes to those living in and around the city of Metairie. In September 2007, the House of Bishops meet in New Orleans. 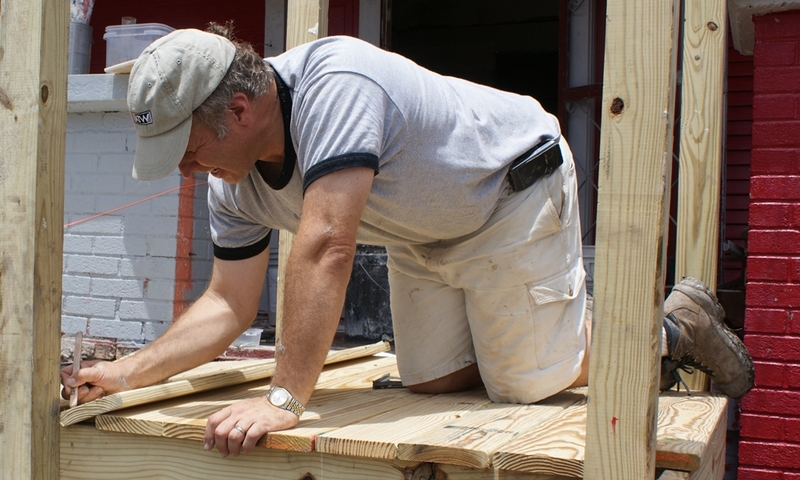 The bishops and their spouses took part in a “Day of Service” doing everything from rebuilding houses to serving food. One of the most memorable moments was the ecumenical service held at the Ernest N. Morial Convention Center where the Archbishop of Canterbury, the Most Rev. Dr. Rowan Williams, preached and celebrated. Read the Episcopal News Service Series Out of Deep Water, a week long series covering the 10th Anniversary of Hurricane Katrina. 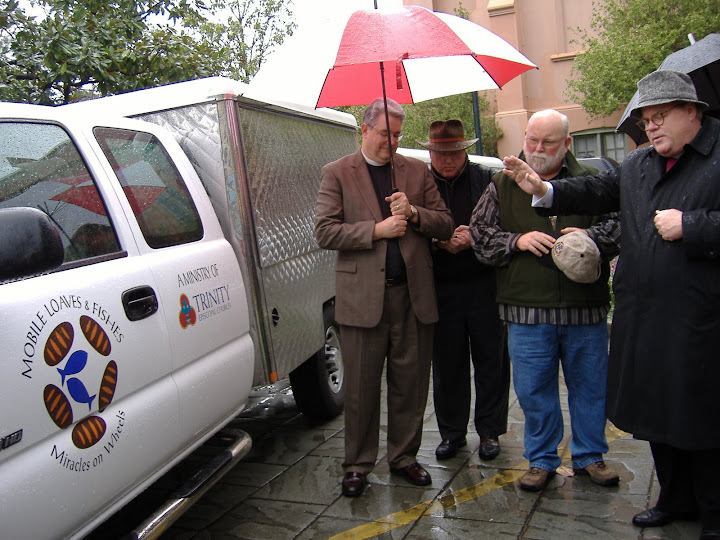 These were long and tiring years but our diocese came out stronger and the lessons learned enabled us to respond effectively to the disasters (Hurricane Gustav, the Gulf of Mexico Oil Spill, Hurricane Isaac…) that followed. We learned to do God’s work in new and unique ways. We learned to listen to and respond to where God was calling us. We got to know our neighbors. Over the past decade there have been many ministries formed built on those lessons learned. We pray we will never forget. Visit the Episcopal Asset Map to learn more about all the outreach ministries found throughout the Episcopal Diocese of Louisiana. As you read above, some of the programs born in the wake of Hurricane Katrina are still in operation today. While they may have changed focus, they are still filling an important and much needed service in the community. Click on the links to learn more and see how you can support them in their mission.